With five out of 10 recipes featuring seafood, the 23rd Annual Lodge National Cornbread Cook-off is indeed expanding the concept of Cornbread. Held in conjunction with the 23rd Annual National Cornbread Festival, which takes place April 27-28, the Lodge National Cornbread Cook-off begins at 11 a.m., Saturday, April 27. The Lodge National Cornbread Cook-off committee received recipe submissions from December 3, 2018, through January 31, 2019. Contestants have to make main dish or entrée recipes with a cup of Martha White Cornmeal and in a Lodge seasoned cast iron skillet. The Cook-off Champion receives a $5,000 cash prize and a 30-inch stainless steel gas range ($3,250 value) from FiveStar Professional Cooking Equipment, a division of Brown Stove Works. The second place competitor receives $1,500, and the third place competitor receives $1,000. The remaining seven finalists will collect $150. All finalists receive a $500 travel reimbursement. To enhance audience appeal, the cook-off features an Iron Chef format with one continuous competition. The cook-off stage is located on Third Street in downtown South Pittsburg. 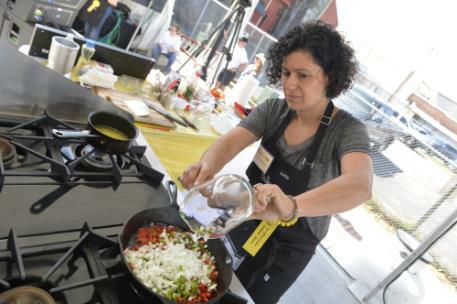 Judges for the cook-off are well-respected chefs, culinary influencers and food writers. Just like previous Lodge National Cornbread Cook-offs, the field of competitors hails from states throughout the country, including Illinois, New Jersey, Utah, California and Tennessee. For more information on the festival and cook-off, go to www.nationalcornbread.com.